Together We Are Strong. Together We Are Safe. A panel of religious leaders and an immigration expert addressed the travel ban for predominately Muslim countries and how we can uphold our values and keep Montgomery County safe. 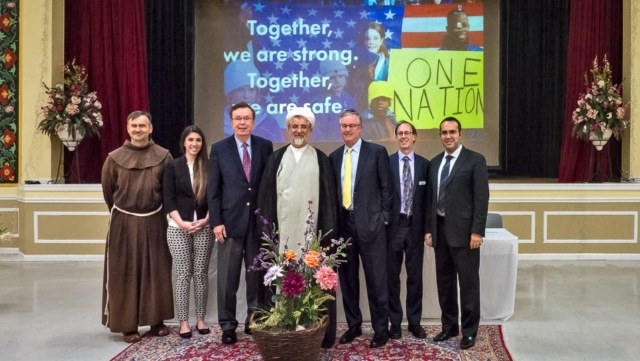 It was hosted by the Islamic Education Center in Rockville. Panelists included Imam Ahmad Bahraini, Father Jacek Orzechowski, Rev. Kasey Kaseman and Kiyanoush Razaghi. It was moderated by Shane Rock and David Trone addressed the importance of supporting refugees and immigrants. The Montgomery County Faith Community, mobilized through the Welcoming Our New Neighbors program, has over 60 faith communities working primarily within interfaith clusters. Together they have raised in excess of $400,000 and marshaled 330 volunteers in support of 25 refugee families. Housing and employment remain the top priorities with legal assistance, mentoring, teaching English and offering general support being ways others may help.